Teeth and the way they look are a significant part of the smile and if they don't look well, people tend to get self conscious of their smile. There are easy ways to achieve a better looking smile and dental bonding is one of them.The term bonding refers to the addition of composite or porcelain veneers at your anterior teeth. 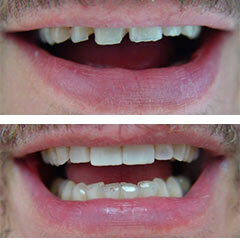 Usually the term is used mostly to describe the placement of composite resin at the labial surface of the upper teeth. Our purpose is to inform you about issues related to Prosthodontics, Esthetic and Implant Dentistry. The posts answer questions often asked by the patients in our clinic, offer advices about the care of your teeth and smile and inform about the changes in the scientific field of Dentistry. Browse through our topics; choose the one that interests you, and feel free to contact us through the comment form you'll find in the end of each post. We appreciate your input and we expect it.